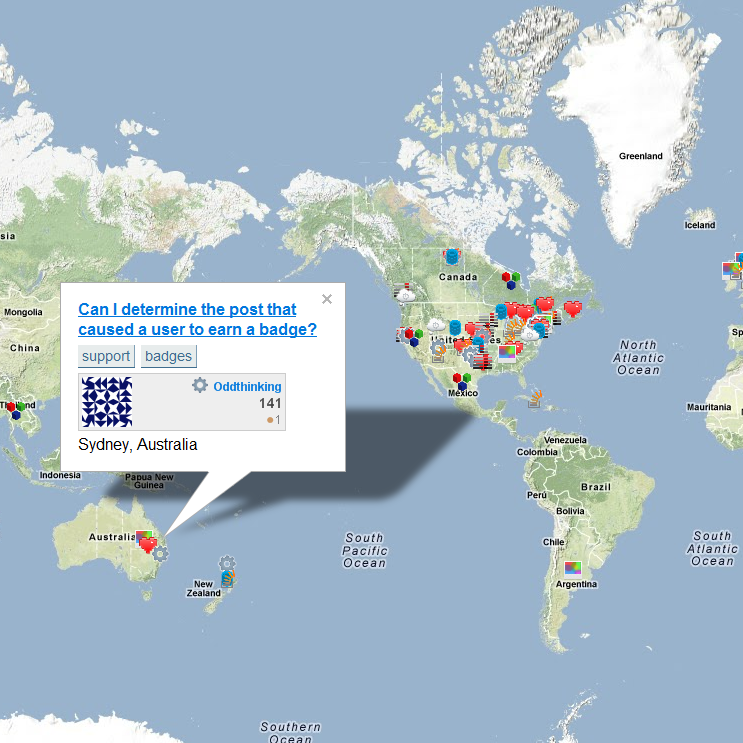 Ever wanted to see just what kind of locations are posting to the various Stack Exchange sites at any given time? Even if you haven't, you'll find it with StackGeography. NEW! Now with multiple-site concurrent polling goodness! No download necessary, just visit stackgeography.apphb.com. NOTE: With AppHarbor phasing out free custom domains at the end of the month, if www.stackgeography.com stops resolving correctly, you should be able to get there with the direct AppHarbor domain: stackgeography.apphb.com. Bugs and requests and such can go on the StackGeography GitHub repository. Ability to poll meta Stack Exchange sites, defaults to omit to keep site list shorter (toggle via saved option). Marker placement can be staggered via saved option. Clear map markers via #. Polling multiple sites concurrently! The UI still needs work, but if you return to site selection by pressing S, you can keep adding sites to poll. Polling management: hit P to view pending polls and cancel some/all of them. Options management: hit O to view/set options (more options to come). 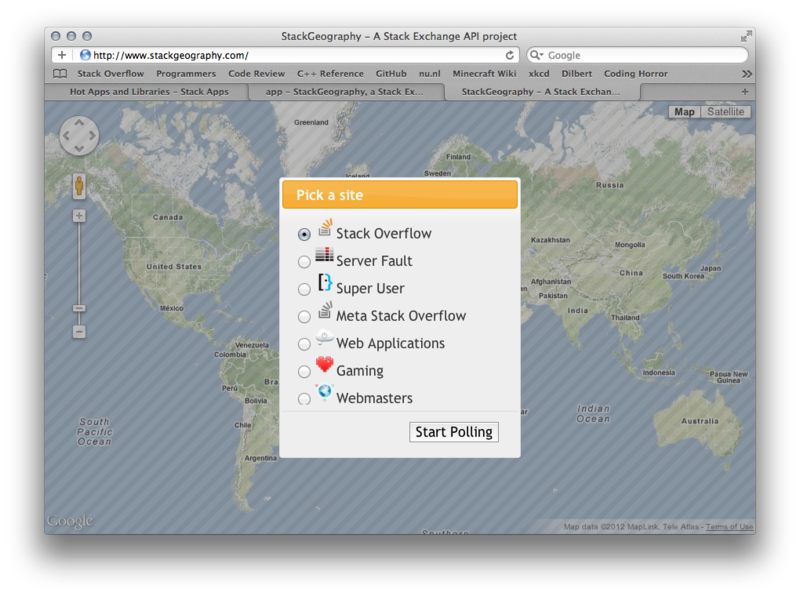 Using localStore for StackGeography options (currently only saving last selected site and maximum map markers). Mark questions with site-specific map markers. Toggle site-based map markers vs. generic stackgeography.com map marker. Change max number of markers shown (default 500). Switched to ASP.NET MVC to make it easier to output-cache common API hits on the server. 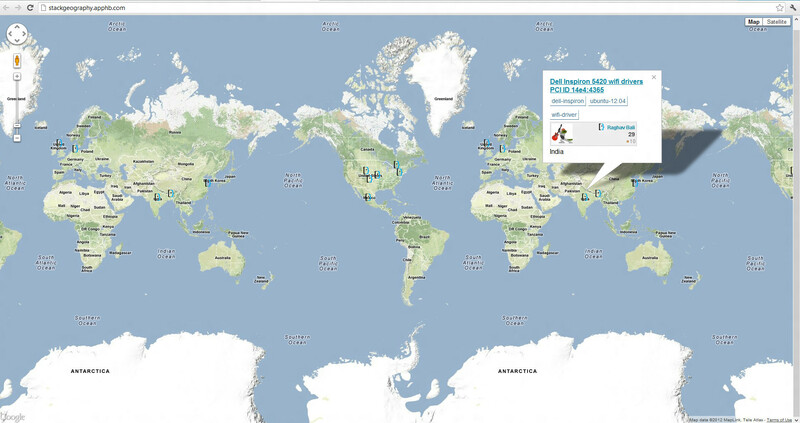 Added location geocoding in batches (up to 100). Added filters to the Stack Exchange API calls to cut down on JSON coming back from those requests. Switched to SQL Server on AppHarbor to avoid locking issues on geocode cache inserts. Added keyboard shortcuts (? brings up hint window). Google Maps 403 issue patched with server-side caching proxy for geocoding API requests. The scrollbar in the "pick a site" dialog isn't visible in Mac OS X Lion while scrolling (usually it appears only when scrolling, but here it doesn't). Besides that, it's very cool! If I could make one suggestion, it would be great if you could set a cookie and keep my polling option (which site I want to poll) and maybe just give me a list to refresh and show the dialog again. I often check the site, find an interesting question which takes me to stack overflow. When I come back, I have to select my polling option again. The map repeats itself. Additionally, when selecting a post, the second incarnation of the icon gets the tool tip like box, not the one I clicked. Not the answer you're looking for? Browse other questions tagged app api-v2 website .